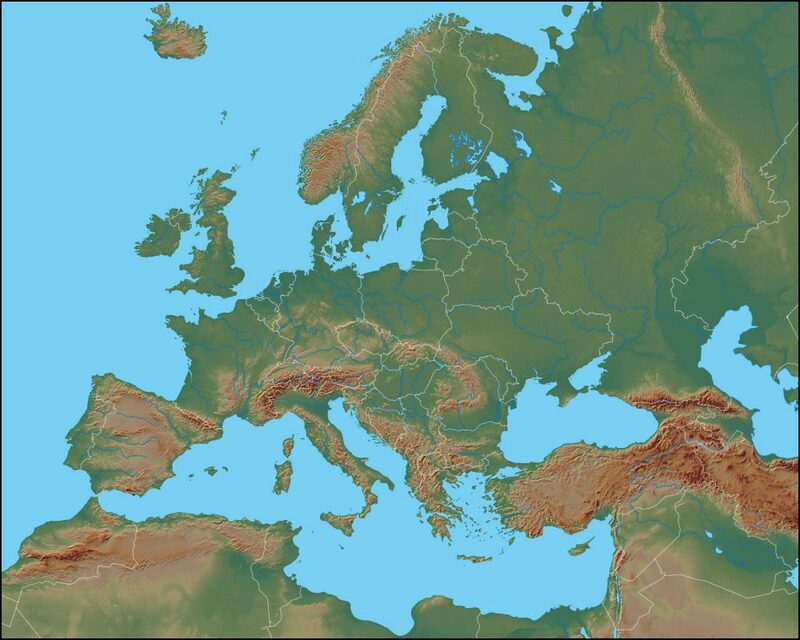 The map above reveals the physical landscape of Europe. There are several important mountain ranges. The Pyrenese Mountains are the boundary between Spain and France. The Alps separate Italy from countries to the north. The Massif Central is in the southwest of France. In Greece are the Pindus Mountains and the Rhodope Mountains. The Caucasus Mountains separate Georgia and Azerbaijan from Russia. Eastern Europe has the Carpathian Mountains and the Transylvanian Alps. The Ural Mountains trend north-south through Russia, and most physical geographers consider them to be the dividing range between Europe and Asia. Major bodies of water include the Caspian Sea, Black Sea, Aegean Sea, Ionian Sea, Adriatic Sea, Mediterranean Sea, Balearic Sea, Alboran Sea, Bay of Biscay, Celtic Sea, English Channel, North Sea, Norwegian Sea, Baltic Sea, Barents Sea, White Sea, and the Gulf of Bothnia.